Have you always wanted to find out what it would be like to be a samurai? 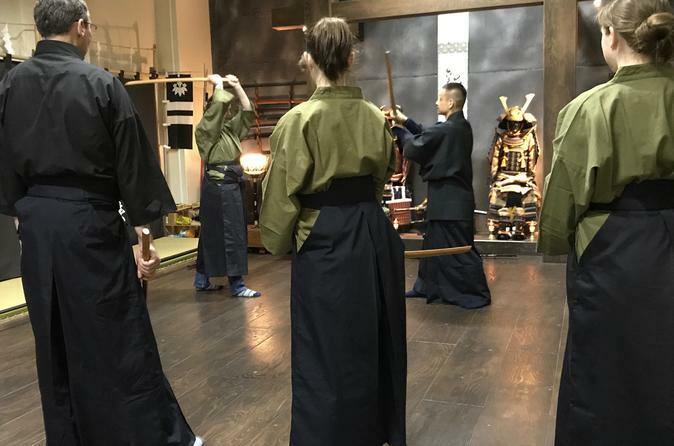 With this workshop, you can learn the authentic way of samurai used to use swords at the Musashi Clan Dojo. Through this private lesson, you'll also gain a historical insight into the way of the samurai. Learn the history of traditional swordsmanship with roots that can be traced back more than 420 years. Upon changing to gi and hakama, you'll learn the proper manner for entering the dojo, the etiquette for beginning and ending class, how to throw bo-shuriken (spike), the correct way to show respect to the sword and handle it properly. Using a bokken (wooden sword), you will learn the basic stances like Seigan, Hasso, Johdan, Gedan, etc. and how to move and cut diagnally, horizontally and parry. Then you will receive a short partner training which will help develop proper distance, positioning and correct timing and focusing. You'll also learn a bit of samurai history and their philosophy. The samurai class was established by the 12th century. Samurai worked for feudal lords and were renowned for their bravery and code of honor. They were well-educated martial artists. They adhered to the code of warriors that forbade them from striking enemies from behind or pillaging unnecessarily. If they dishonored themselves or the samurai tradition, they were honor-bound to commit a ritual suicide.